There are lots of articles and images circulating from yesterday’s CW Upfronts in New York. Below is a post from Just Jared. Keep checking back for more throughout the next few days. Unfortunately Thomas seems to have been the least-interviewed attendee, but hopefully some videos will surface soon. Thomas Dekker strikes a pose with Britt Robertson at The CW’s Upfront held at Jazz at Lincoln Center on Thursday (May 19) in New York City. The 23-year-old actor and 21-year-old actress will star in The Secret Circle, which will air on Thursday nights beginning in the fall. The Secret Circle is based on the book series by Vampire Diaries author L.J. Smith. Britt plays Cassie, a young woman who discovers that not only is she a witch but also part of a top-secret coven. Thomas takes on the role of Adam, the oldest member of the coven and a love interest for Cassie. 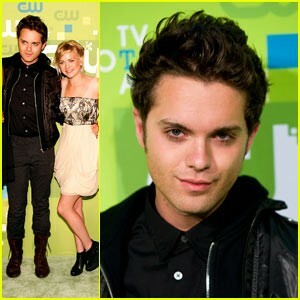 Thomas Dekker: CW Upfront with Britt Robertson! | Brittany Robertson, Gale Harold, Natasha Henstridge, Thomas Dekker : Just Jared.